The majority of Ueberschall's Elastik-based libraries come in an easy-to-use construction kit format: lots of loops organised into subsets suitable for building a complete song structure with intro, verses, bridge, chorus and endings. Yes, you need to add your own vocals and perhaps a little personal ear-candy to make it your own, but with the Elastik front-end, the format is super-easy to use, especially if you're a busy media composer needing two minutes of a specific style by yesterday. 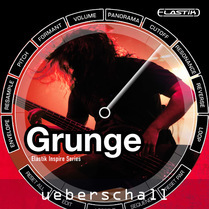 However, Ueberschall also have their Elastik Inspire series, and the subject of this review — Grunge — belongs to this series. In essence, with the Inspire titles, you just get a collection of loops in a particular musical genre, generally organised into instrument groups, and it's up you to work out how you might piece them together. This makes for harder work — you might use just one or two loops to 'inspire' you in order to build something further — but perhaps does involve a little more creativity on the part of the user. Grunge provides just over 500 loops (500MB of sample data) and is organised into drums, bass, crunch guitar and distortion guitar groups. The library title is obviously going to conjure images of classic grunge bands like Nirvana and, yes, there are plenty of guitar and bass riffs here that fit right into that mould. However, don't let this fool you into thinking that you are being time-warped back to the early 1990s; there is also plenty here that would work in modern indie, garage or blues-inspired rock, or any contemporary rock style where the emphasis is on vibe rather than technical polish. For me, the guitars and basses work best. It is pretty easy to mix and match to find sounds and parts that can work together, which you might then flesh out with some additional playing of your own. Both the playing and the sounds are excellent and as well as a large selection of fairly conventional electric guitar tones, there are also some nicely processed parts that would easily pop out even in a busy mix. The drum loops are equally well played and recorded. However, as there's a range of different kits and varied processing is applied, finding a few loops from this folder that you can tie together to make a coherent performance and which are also sonically similar takes a bit more work. When it comes to building drum performances from loops, the construction-kit approach has an edge. This minor comment aside, Grunge is full of stuff that could easily spark off the creative process and, at this price, the library offers good value for money. If you like your rock with a slightly left field edge, Grunge has plenty to inspire you.